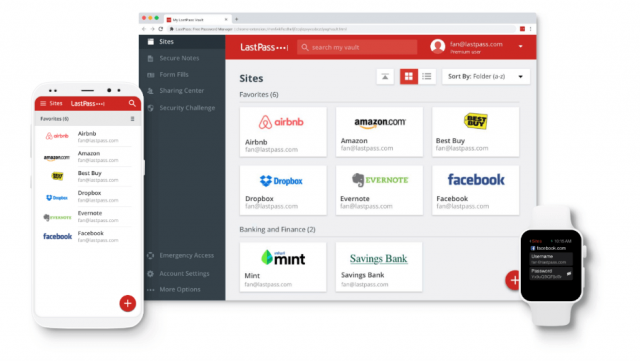 LastPass is one of the best password managers you can choose – it’s easy to set up, secure, and flexible. If you're fed up of trying to remember all your own passwords, making the move to LastPass is a seriously smart choice. Connection issues, though rare, can make password changes maddening. Password changing feature is very manual the first time round. 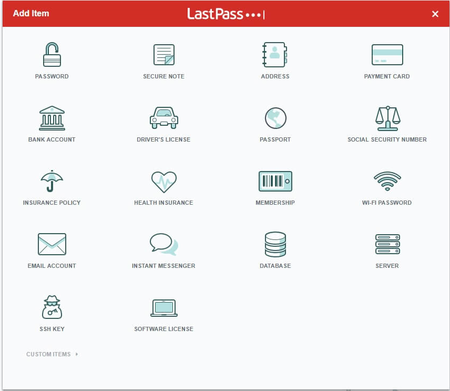 LastPass is one of the best password managers you can choose – it’s easy to set up, secure, and flexible. This popular password manager can create passwords for you and store them securely, autofilling them when needed. Lastpass can take the hassle out of remembering multiple online passwords. For a small fee, LastPass Premium will let you use the service over multiple devices – it works on Windows, Mac and Linux PCs via simple browser add-ons (extensions). For tablets and smartphones, there’s a simple LastPass app. Set yourself up with LastPass and you can say goodbye to the worst habits many users fall into when coming up with logins for multiple sites. Instead, you can enjoy proper online security when logging into sites and services. If you’d like to see how LastPass stacks up against other password managers, check out our comparison table. Left to their own devices, most users are terrible at creating passwords. After all, it’s a pain to remember five different passwords, let alone 10 or 20. All too often, users pick one password, then re-use it over and over. That’s highly risky – if the login data for even one of your accounts is ever stolen, then hackers have they key to all the others that share that password. On top of this, too many users rely on classic, but easily guessable, passwords such as ‘123456’, ‘password’, ‘qwerty’, and variations of pets’ names or the names of family members. LastPass can alleviate all this risk, and make it easier to manage all your various online accounts. It can auto-generate secure passwords – a unique, unguessable one for each of your online accounts – then autofill these securely as you log in. All you need to remember is one master password for your LastPass account – just make sure it’s both secure and memorable. The core of LastPass is the vault. This is where your passwords are stored. Without your master password, your vault is encrypted – it’s just a bunch of garbled data that won’t make sense to anyone, even if hacked. Unlock the vault with that password, however, and your data is readable. Passwords and account usernames are stored in the vault along with the web address (URL) used for logging in to each account. If you land on a site with one of your stored logins, Lastpass will either automatically fill in your login credentials or make them available upon request. You can organize your login credentials into different folders such as work, home, and so on. LastPass also lets you add any notes if you need to. Under Advanced Settings, you can adjust features, such as automatically filling out login forms, or requiring you to re-enter your master password for access to particularly sensitive logins. The password reprompt is particularly useful if you share a PC with others. That way, no one can log in to key accounts such as your bank or email without knowing the master password – even if you’re already logged into LastPass on the shared computer. The vault doesn’t only hold passwords. It can also hold notes with information you may want to keep private. You can use this to store product licences for paid software, for example, or backup codes for two-factor authentication logins. it can also tell you when you’re using the same password with multiple accounts and offers to change them. 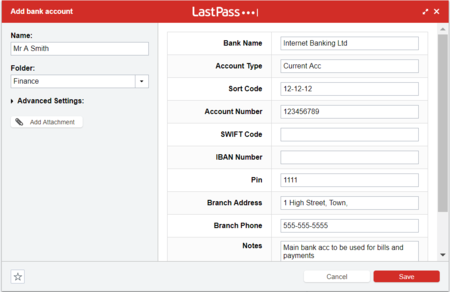 Another way to use LastPass is to remember your payment details so that it can fill out a credit card form automatically. There’s also an automated password-changing tool. This can easily change the passwords you use on major websites. To use it, simply look in your vault and open a specific login – such as for Google or Facebook. Then, under the saved password box, you’ll see a link titled Auto-Change Password. Click this, and LastPass will help you create and register a new password for that site with minimal fuss. Of course, putting all your password eggs in one basket – no matter how secure – can feel daunting. To keep your mind at ease, LastPass has a helpful feature called Emergency Access. This allows nominated trusted people get access to your account, if needed. This is a great feature if you should become incapacitated, or if you’ve forgotten your Master Password. To set-up Emergency Access, go to your vault and select Emergency Access from the left-hand column. To give someone access to your vault, enter their email address and specify a wait time after they’ve requested access to your vault. LastPass offers a number of wait times, from immediately, to 30 days. The idea with the wait time is it gives you time to reject their access request if you need to. The default is 48 hours. Overall, LastPass’ approach is great, but there are a few drawbacks. Re-entering your master password for added security won’t feel ideal for everyone. It can be tedious if you have to do it each time you land on a site, compared autofilled logins. To alleviate this pain-point, only use this advanced security measure for key accounts where you feel the added hassle is worth it. Once you’ve created a new login, you can ask LastPass to generate a new password for you, and then automatically add it to the sign-up form. That’s a fantastic lifesaver, but it also has one big downside – if your connection to LastPass’ servers aren’t working, then LastPass may not remember that it created a new password for the site. That is really, really bad. Sure, you have a new, secure password, but you have no idea what it is. Yikes. In practice, this is unlikely to happen often. But, when it does, it’s little short of infuriating. Finally, the automated password changing tool is not as robust as with other services. It can only change site passwords one-by-one. Other tools, such as Dashlane can change multiple passwords at once. In practice, this isn’t a drawback that you’re likely to encounter throughout the lifespan of your LastPass usage – it’s more of a pain point when first setting up, putting more onus on you to do a bit of manual setup. LastPass offers a number of price ranges, including a free option. If you only want to use LastPass on a single device, such as your PC or smartphone, then you can use LastPass for free. However, there’s a limitation with this approach – very few of us use just one device these days. If you want to log into services via LastPass on both your laptop and your phone, then LastPass Free isn’t the way to go. Instead, you should be thinking LastPass Premium. If – in a more likely scenario – you want access to the same password vault across all your devices, then you need LastPass Premium, which costs $36 per year. To set up LastPass for your entire family (up to 6 users maximum) it’ll cost you double that, at $48 per year. Business users, meanwhile, have the LastPass Enterprise option. For up to 50 seats you can pay $29 per user. Larger enterprises can pay $48 per user with added features, such as administrative control and the ability to monitor users’ password management behavior. Although they both offer a similar service, there are some key differences between LastPass and Dashlane. For a start, Lastpass is the cheaper of the two, so if budget is your main concern, then this could sway you. However, we did find that Dashlane has a dedicated chat function, which you could be appealing if you come unstuck and need help. Compare both the services in our LastPass Vs Dashlane guide. Another highly rated password manager is 1Password, a complete package that offers a lot of features designed to make password management an easy task. 1Password has some neat tricks up its sleeve, such as the ability to create multiple vaults, so that there’s no crossover between your work activity and personal online life. 1Password is more expensive than LastPass (99 whole cents a month, to be precise), but we think it’s worth it. Compare both the services in our LastPass Vs 1Password guide. Using LastPass via a web browser is easy. First, you install the browser add-on from LastPass.com. The site will detect which browser you’re using and install the add-on directly. In the case of Microsoft Edge, it sends you to the browser’s add-on catalog. Once you’ve installed LastPass, you’ll be directed to create a new account or sign-in to your existing one. If you’re creating a new account, LastPass will give you some guidance on creating a new master password. This step is important, since all your other passwords will be locked behind this master password. It has to be hard-to-guess for the bad guys, but easy for you to remember. If you forget this password, you’ll lose access to your entire password database and all your logins. This is why LastPass advises you to create a password that ‘tells a story unique to you’. You can merge together four or five separate words that mean something to you alone – for instance, ‘fifiatemywoolsox’, or a favourite song lyric. This should make it easier to remember, and replaces the previously popular method of creating an alpha-numeric password with six to ten random characters, symbols and numbers. Once you have your master password, it’s time to start saving all your other passwords. If you’ve been using another password manager or the built-in one with your browser, you should be able to import your database by clicking on the LastPass icon in your browser and going to More options > Advanced > Import. Overall, LastPass is a great choice. It’s well-priced, it works with nearly every device you’ll need it for, and it’s very secure. The service’s automated password changer could be a little more convenient, but the pros certainly outweigh the cons and we’d readily recommend using LastPass rather than trying to remember all your passwords yourself.